What do you need to turn your phone into a remote? Just two things: a Parkingdoor device installed next to the garage door and an Android or iOS device with the Parkingdoor app installed. Parkingdoor turns your mobile into your garage remote. Now there's no need to worry about taking your remote when you leave the house or leaving it in the wrong car. With Parkingdoor installed in your garage you can give other people access and they can open the door with their own mobile. They can only come in and out of the garage at the times you've given them permission to do so, and you'll have a record of each time the door's been opened. And what's more, all communications between your mobile and the device are heavily encrypted. If you have several garages there's no need to carry a remote for each one - turn your mobile into universal remote with Parkingdoor*. * You need to place a Parkingdoor device on each door. Delivery to the whole of Spain except the Canary Islands, Ceuta and Melilla. Accepted payment methods: American Express, VISA, and Mastercard. Do you not have an individual garage? Discover what Parkingdoor can offer your community of residents. A system comprising a smart device placed next to the garage door, and a website, and iOS or Android app to manage it. With Parkingdoor in your garage you can choose who to give access to, and they can open the door with their mobile - only when you want. How does the Parkingdoor device work? The Parkingdoor device connects to your existing opening system either wirelessly or with a cable, meaning you can create 'virtual keys' which you can send to anyone you'd like to give access to. The people you invite can then use their mobile to open the door to your car park without you having to lend them your remote or any physical keys. You can specify the days and times you want each visitor to have access for via the Parkingdoor app - and you can withdraw access at any time, in real time. Do I need an internet connection to use Parkingdoor? No, Parkingdoor doesn't need to be connected to the internet in order to work properly. The connection between your mobile and the Parkingdoor device is made over Bluetooth, so you don't need internet access to open your garage door. You only need an internet connection on your phone when you're setting up the device for the first time. What if the battery on my mobile runs out? Could I use the remote or a key? Parkingdoor will always allow you to continue using your old opening devices (old remote or key). Alternatively, you could ask a friend or neighbour for their mobile, download the app, access it with your username and password, and open the door (remembering to exit the app afterwards). What is the difference between Parkingdoor wireless and Parkingdoor with a cable? The functions of the app and the website are the same for Parkingdoor wireless and Parkingdoor with a cable. The choice of one or the other depends above all on the opening system you currently have installed. 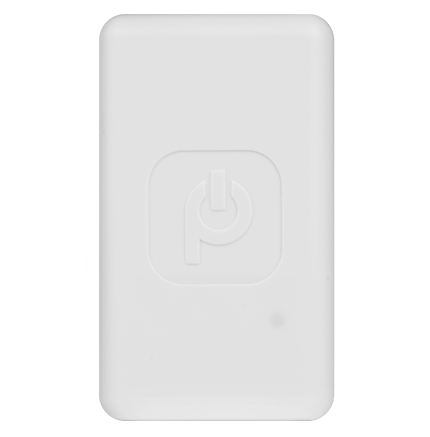 if your system works with fixed-code remote controls (which can easily be copied), we recommend Parkingdoor wireless, which does not require any installation. if your system works with remote controls that cannot be copied, or with variable-code or rolling-code remote controls, you should choose Parkingdoor with a cable. This version is installed on the opening system like another button and it allows you to open the garage with a mobile phone even if you can't copy the remote control. How do I install Parkingdoor in my garage? There are no holes to make or cables to connect to install the Parkingdoor wireless device. You will see an adhesive strip on the back of the device. By removing the protector you can stick it to any surface (wall, opening book, door, or any other smooth and clean surface). It will not take you more than a minute to fit it and it requires nothing but your old remote control to configure it. You don't have to touch anything in your current opening system, adjust the opening mechanism or connect any cables. The Parkingdoor device with a cable is compatible with any type of motorised door and it is very easy to install in the door opening mechanism. Watch this simple video and find out how to install it yourself.